A selection of lovely Autumn photos from the Arboretum at Winkworth near Godalming in Surrey. I recently visited the Winkworth Arboretum in Surrey (United Kingdom) and had the chance to take some photos of the Autumn colour on display. From red Japanese Maples to yellow Azaleas this attraction has much to offer including a lake and three separate walks including one for wheelchair users. 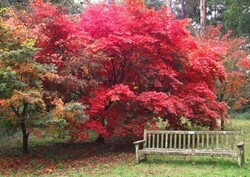 The Arboretum is a great place to visit all year round but especially so during Autumn or Springtime. Looking down into the "Badgers Bowl"
Entry fee can be refunded if you become a National Trust member on the day. A car park is close by, there is also an overflow car park but the Arboretum can get busy during peak times so do plan ahead and if possible come during the week or early/late in the day. The Arboretum has three waymarked routes of varying length, one of which is suitable for wheelchair users. The other routes involve some steep climbs and steps. All three routes offer fantastic views, a truly fantastic place for the budding photographer to visit. There is also a children's trail and quiz so youngsters can stay entertained. Toilets are on site, including for the disabled, also baby changing facilities. A cafe can be found near the entrance but it is only open during peak times and can be quite expensive. Outdoor seating is by the entrance with several benches along the three marked routes. The main information desk can provide advice and maps etc. More information can be found on the official National Trust website. If you liked the Arboretum in Godalming, Surrey then you may want to try visiting the following, they are all located in Southern England and make for a great family day out. Wakehurst Place, West Sussex - Part of Royal Botanical Gardens Kew. Royal Horticultural Society Gardens in Wisley Surrey. Feel free to leave your thoughts or suggestions in the comments section below. You are also welcome to share this page on Facebook/Twitter or to share my photos on Pinterest with your friends.